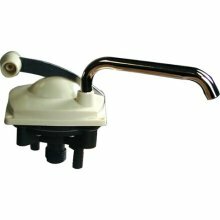 1) A full stroke of the handle up and down causes the fixture to function as a hand pump providing greater water flow with minimum effort. 2) To press the handle to the "down" position delivers "city" water. very quick delivery. no problem with my order and working good. Product arrived exactly as described, and quick! I received it in less than a week, even though I chose the cheapest shipping method. It was a perfect replacement for my original and works like a champ. You guys are a pleasure to do business with. "Fast Shipping, Excellent Customer Service!!"" "Shipped items from two locations, tracking was great. Well satisfied with products and service...."
"Got exactly what I wanted."